This guide shows you how to create a bootable Linux Mint USB drive with persistence. Click here for an alternative guide for creating a Linux Mint USB drive which will work on computers with UEFI. 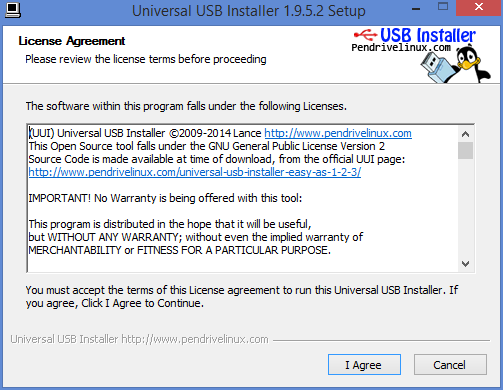 To create a bootable USB drive the tool that I advocate using is the Universal USB Installer from www.pendrivelinux.com. Follow the above link for pendrive Linux and scroll half way down the page until you see the “Download UUI” link. Click on the download link and wait for the program to download. When the license agreement screen appears read it and then click “I Agree” if you accept the license. Click on the “Browse” button. Find the downloaded Linux Mint ISO. Select your chosen USB drive letter and make sure that the “We will format” option is checked. If you are happy to continue click “Yes”. problem solved, my flash drive has passed on. another flash drive worked fine. thank you! Can you save data on the USB flash drive along with the Linux Mint OS? Hi, during the creation process there is an option to create a persistent file. You need to specify a file size for the persistent file in order to be able to save data. See step 2, 4th image down. (It has a 4. persistent file) bit. Thanks for tutorial. No persistence option when booting live usb in windows 8.1. How do I fix this please? So if I have an 8 GB USB drive and want to put a bootable 1.4 GB Linux Mint 17.1 on it, I should make the persistent file 6.5 GB or so in order to use the rest of the USB drive for regular storage? I just want to make sure that it it's not the other way around, and that it'd be the Linux Mint 17.1 that would take up 6.5 GB. Nope It's not right! The persistent file size is set to install/store stuff you download when you are using the Linux Mint rather not for regular storage. Ignore that question. Mint will continue after a few seconds automatically. When you say all you get is the Linux Mint screen do you see the whole of the Linux Mint screen? Can you click the icons etc? I had the same problems, black screen, partial desktop, frozen cursor etc. Seems the fix was to run it in compatibility mode and under menu, administrator, change Nvidia to the 173 driver and reboot. After that, I just adjusted my display settings. I had the same problems running from the Live DVD. Hope this helps. When I try to boot from the USB, after selecting the "Start Linux Mint 17 Cinnamon" option, the screen goes black … any advice? i have the same issue but none of the things that page said helped me any..
i did whatever u told but after restarting computer and plugging that usb it says select boot device is not available, retry this, what to do? please help me over this!! Try "Rufus"….it just worked fine with my pendrive. http://distro.ibiblio.org/puppylinux/puppy-tahr/iso/tahrpup%20-6.0-CE/tahr-6.0.2_PAE.iso TahrPup 6.0.2 ISO with PAE enabled. A great Puppy to use and test on your Computer. Linux Mint 18 is out now, not that it matters too much, but I thought I would remind you of this article in case you wanted to edit it. Thank you, by the way! For some reason, I tried using Windows ISOs burned onto USBs using Rufus and even burning DVDs, but they would not give me the prompt nor even show up properly in the BIOS. I don't have UEFI, so I am hoping this will work so I can delete that pesky Windows.old file taking up precious real-estate on my (new, old one died) boot SSD. I hope this method works.. I tried changing the properties, and I swear I was able to delete that folder, but there it is again, taking up 10% of my main drive! Thank you again, even if this doesn't work, I have another computer I am working on with the same chipset (not that *that* matters in this case) and I can use that to delete the damned folder. Damn yous, TrustedInstaller! I swear I gave myself full control the long, arduous way through Windows 10 and deleted it, but it's here. Wish me luck – even if it doesn't work though, I now have a bootable OS on a 16GB flash drive which I will set up so that I can add progz and customization that will stay and be ready for repair of others computers. Thank you. I have been able to install Linux Mint Cinnamon Rafaela (17.2) through a bootable USB drive flawlessly thanks to your simple instructions with clear and easy to follow guide. This was about a few weeks ago and I am now enjoying my Linux Mint experience immensely. I used this process and it worked on my hp laptop but is not working on my mac, is it a different process for mac? So if i use put this on my flash drive and put it in my laptop which dosnt have an os i can boot it up and with this it will have linux? I get "SYSLINUX 4.07 EDD …, gfxboot.c32: not a COM32R image, boot:"
I saw that typing help should work, but when I try that, I get "Could not find kernel image: help"
I have a problem similar to Leo. I get "SYSLINUX 4.07 EED 2013-07-25 Copyright (C) 1994-2013 M. Peter Alvin et al"
There is a blinking curser on the next line, but there is no response to any keyboard input. Any help appreciated. It worked but for some reason any change I do is reverted back to the point right after the installation. For example I download file, it is gone after reboot, I change root password, it is back to default, I install nvidia drivers, after reboot they are gone. Why this is happening??? I've installed it without any problems and it boots up nicely BUT it wont remember any changes I make after reboot! downloaded files are disparaging, new root password reverts back to default, GPU drivers are also reverted. After every boot it is clean factory default system. Why??? Thanks for this wonderful post. It's great the people take the time to help others in the computing world. Awesome simple step by step instructions. How can I make flashdrive bootable with mint using ububtu OS? I have installed linux mint in my pd but softwares are not getting installed in it . They always removed when i restart my system . How to fix that problem please help me . The Unix Live installer did not work on Windows XP and turned my 64Gb thumb drive into a brick that could no longer be formatted on Windows. Only another Linux box could repartition and reformat the thumb drive. I would up using LiLi instead.